Starting today, you can add tags to your Amazon Elastic Container Registry (Amazon ECR) resources. This new feature enables better grouping of ECR repositories, better searching and filtering in the console, and better cost allocation. In this post, I show you how to create a tagging strategy. You could have repositories to host your development Docker images, and keep different repositories for hosting production images. You could group repositories together according to the organization of the development teams. In this example company, there are 10 services to manage. Realistically, these services would easily number into the hundreds or thousands for many ecommerce websites. You would likely have one development set of repositories for each service, and another production set. Tag the repositories by team and by service level: development or production. Here’s one example, for the Accounts team repos in development. 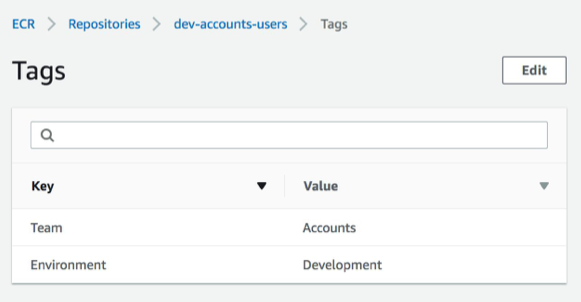 You can also use tags in an IAM policy to allow your dev teams access to the development version of their repositories. For example, you can restrict the ECS and EKS instances to their service level, and allow the SRE team access to all repositories. After you configure these tags appropriately for your repos and set the IAM policy for specific teams, developers can push and pull from any repo tagged for their team. They can even access future repos that are added with their team’s tag. They do not have access to push or pull from a different team’s repo. You can also use tags to track costs and review in the Cost Allocation report. This helps you understand how much you’re spending in dev or prod, and how much for each service and in dev or prod per service group. Add your billing tags to your repositories. With today’s feature launch for adding tags to ECR resources, you can now apply policies and analyze costs by grouping ECR repositories together in many different ways. For more information, see Tagging Your Amazon ECS Resources. For the public roadmap for container releases, see the containers-roadmap on GitHub. I hope you find this helpful. If you have other creative and useful tagging schemes, for ECR or ECS, please share in the comments.